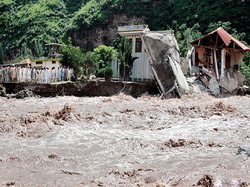 The 2010 Pakistan floods began in July 2010 following heavy monsoon rains in the Khyber Pakhtunkhwa, Sindh, Punjab and Balochistan regions of Pakistan. Present estimates indicate that over two thousand people have died and over a million homes have been destroyed since the flooding began. The United Nations estimates that more than 21 million people are injured or homeless as a result of the flooding,exceeding the combined total of individuals affected by the 2004 Indian Ocean tsunami, the 2005 Kashmir earthquake and the 2010 Haiti earthquake. However, the death count in each of those three disasters was significantly higher than the number of people killed so far in the floods.At one point, approximately one-fifth of Pakistan's total land area was underwater due to the flooding. UN Secretary-general Ban Ki-Moon has asked for an initial $460 million for emergency relief, noting that the flood was the worst disaster he had ever seen. 50% of the relief funds requested has been received as of 15 August 2010. The U.N. is concerned that aid is not arriving fast enough, while the World Health Organization reported that ten million people were forced to drink unsafe water. The Pakistani economy has been harmed by extensive damage to infrastructure and crops. Structural damages are estimated to exceed 4 billion USD, and wheat crop damages are estimated to be over 500 million USD. Officials estimate the total economic impact to be as much as 43 billion USD. Rescue and Relief operations in many remote villages are in an inferior position, as roads are covered with Mud and many affected areas remain unapproachable. Heavy equipment is needed to clear the roads and to rescue survivors buried under the Flood wreckage, as many rescuers are still picking the rubble with pickaxes and their bare hands, looking for survivors. Talon Fair TradeWelfare Society has Planned to Rebuild the Girls School(s) in the Flood Effected Area and planned to focus on the District Layyah(Punjab) where Talon Fair Trade Welfare Society will utilize the funds to make sure the education for Girls .